Here, in the south of England, we have been having days of warm, sunny weather which has allowed me to be out in the garden cutting back the plant material. The result is that the place not only looks double the size, but much more tidy and ‘shipshape’ for the new season as well. I find that many people are afraid to cut back woody material since they think that they will kill the plant. The solution to doing something to the ‘wretched thing’, is to trim it into a rounded lollipop shape, so that the growth becomes thicker and thicker and you end up with a series of balls in the garden, looking like the local parks department. 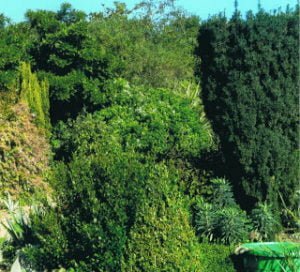 Really pruned, that is thinned to reduce the head of the plant, and its thickness at the right time of year, you in fact rejuvenate your plant, and they take on a new lease of life. 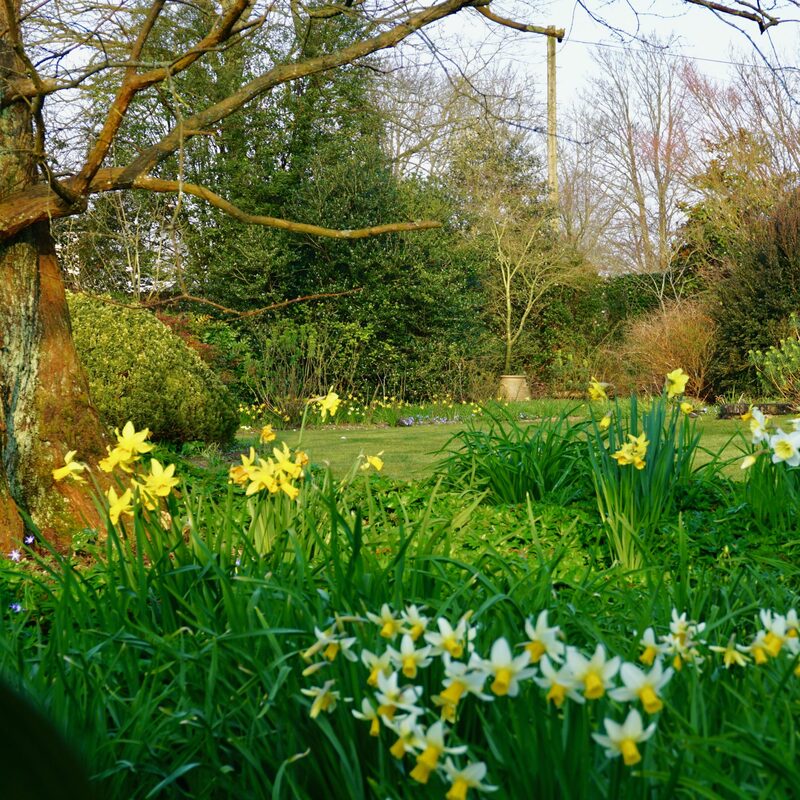 But what is the right time of year to give your garden this attention? Well obviously, and if you can avoid it, you do not cut back a plant just before it comes into flower. So cut back when it has finished flowering so that you allow a full years growing time before flowering again. It makes sense?! 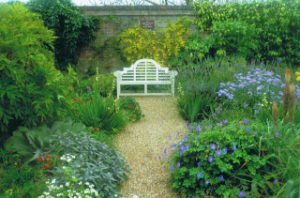 The walled garden prior to cutting back. The winter before last I really tore into our walled garden which was initially a mixture of both shrubs and perennials, but the shrubs had taken over, making the garden too dark for the flowering of the perennials, which generally prefer plenty of sun. 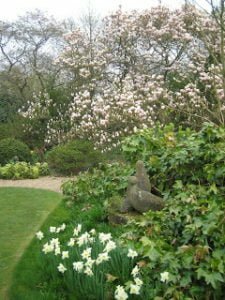 While I like the look of mixed planting, because of course the shrub material gives interest throughout the whole year, particularly if you use decorative evergreens as well as deciduous material. By decorative evergreens I mean plants such as choisya ternata, some ceanothus, forms of eleagnus, fatsia japonica (in town), ilex (holly) rosemarys, skimmia, viburnum forms, that sort of thing. Illustrated is the walled garden three years ago, and this was it last summer. I also removed some of the shrub material altogether, a pittosprum and choisya. There is also a self-seeded Portuguese laurel that I am training into a pyramid. It will not happen overnight I fear, the boxwood balls have been in the garden for 40 years or so! Just recently I have tackled a fatshedera lizei that makes a handsome architectural backdrop to a sculptural piece of Two Doves, by Marie Gill. I used the birds first of all in a Gold Medal Chelsea Flower Show garden for the FT in 1972, and I then took them as part payment of my fee for designing the garden. The bird’s architectural backdrop seemed to have suffered badly through last winter, so I am wading in there to cut it all back. It may look a bit naked at first, but will thicken up and be fine very soon. 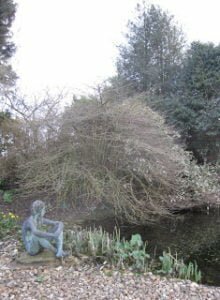 In another part of the garden there is a huge viburnum mariessii which is deciduous (that is it drops its leaves in winter), which is ready for a cut back, but if I do it now, when it will flower in a month or so’s time, I will lose its beautiful, layered white flowers. So it will have to wait for its prune! This viburnum is in for the chop after flowering. 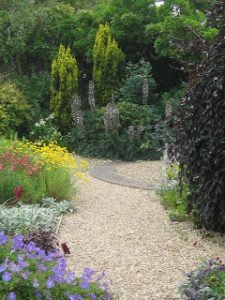 By mixing shrubby material with perennials I can get a variation in size, in foliage forms, colours and textures and flower colour is a bonus on top of that usually. 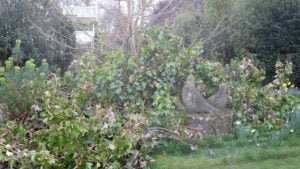 So with pruning saw in hand, loppers and secateurs get out there and start pruning if you have an established garden, or at least think about shaping your plants in a newer one. 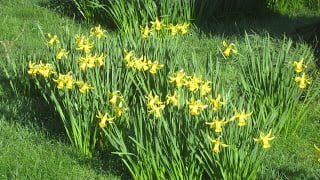 The daffodils are going to be just right at Easter time this year and the early Narcissus February Gold and February Silver are looking at their peak right now. Come see!